While things change, some things stay the same. That can be said about Ryan Blaney’s offseason. While Blaney moved from the Wood Brothers to Penske Racing, he never really moved. Sure, some of Blaney’s crew members might be different and he’s got a new sponsor and car number but since Penske and the Wood Brothers operate under a partnership and Blaney was essentially loaned out to the 21 for experience, the actual biggest change to Blaney’s offseason might be his newly trimmed haircut and clean-shaven look. 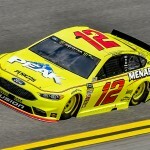 But after grabbing his first win at Pocono and a Round of 8 berth in the Monster Energy NASCAR Cup Series Championship Playoffs, Blaney is coming off his most successful season and there’s nothing that would indicate his stock will go anywhere but up. The driver who many thought had potential is now fulfilling those expectations and is a serious contender to win on and off the track with his ever-increasing popularity. From his Glass Case of Emotion podcast, to his love of all things superhero movies and Star Wars, and all around good deeds like giving a kid the checkered flag after a win, Blaney is showing how great he is as a person as well as backing it up on the racetrack. Ryan Blaney talked to us over the phone to give us his thoughts on The Last Jedi, what he would write for Episode IX, how it is to drive for Roger Penske and maybe wanting to drive one of his cars in other series, and his confidence heading into the new season. Phillip Bupp: How many times have you seen The Last Jedi? Ryan Blaney: I’ve actually only seen it once. I need to, but I just haven’t been able to get back to it. But no, I need to see it again, probably see it a couple more times. The one time I saw it, I thought was pretty good. I thought there was a lot of unanswered questions but I thought, they didn’t answer a few things, but I think they’re just all setting up for the last one. PB: That was what I got from it too, that it’s a very transitional movie from Force Awakens to Episode IX. PB: I understand you got to go to the premiere, right? Blaney: I did, yeah I went to L.A. and got to see it and that was so cool. I was able to go to the Justice Leaguepremiere a couple months before that and it really didn’t compare to how much, you know, what the Star Wars one was blown up and how much they kind of went all out for it. So that was really neat to experience and I got really lucky doing that. So hopefully I can go to the next one. That’d be cool if I can go to the other premiere as well. PB: Did you get to talk to anyone from the cast as well as any other famous people? Blaney: No, I didn’t get to see anybody, we had to get there pretty early. All the cast gets there pretty late so, no, I didn’t really get to talk to anybody from the cast. I saw some people at the reception afterwards, but I didn’t really want to go up and talk to them and bother them. I saw them from a distance. PB: Where would you rank The Last Jedi among the other movies within the three trilogies? Blaney: Hmm, I would probably rank it third or fourth. Phantom Menace is obviously my number one and then I think Empire [Strikes Back]. And then it’s kind of a toss up between, for me, between New Hope and Last Jedi from the trilogies. PB: There were some negative reviews, negative reaction despite most reviews being positive. Of those, did you think that was fair or did you think they might have missed the point as to what was happening? Blaney: Yeah, I saw lots of stuff from people who didn’t like it and I saw some people hated it and I was kind of confused by that. I don’t really know what was really that wrong with it or why people would give it such terrible reviews, but that kind of surprised me. I thought it was a good film and kind of transitioned well, but kept you on the edge of your seat for the next one. Like I said before, I would’ve liked to answer a couple more questions I had and kind of go deeper into details of characters, but maybe they’ll get into that in the next one or maybe even in the Solo movie. I don’t really know what they’re going to base the Solo movie on,l so we’ll see. PB: Yeah, I think after I saw it, I was talking to a couple friends of mine and my take of it was that there were some things I thought could have been improved, could have been done better. But all the great stuff that was in it, the fight scene, overshadowed all the inherent stuff I thought could have been improved and overall was a great movie. Blaney: Yeah, I thought, oh man, the fight scene was pretty unbelievable. With Snoke in there, that was really cool. They did that well. PB: Speaking of Solo, how is your confidence level for Solo going in now that Ron Howard has come on later in the production process, they’ve had to make so many changes and we don’t really know too much and the release is about four months away? Blaney: Yeah, I haven’t really read too much into the movie, we don’t know much about it. I’m not really sure what to expect or what to think about it, I just don’t know. I’m sure they’ll release a trailer here for it pretty soon [Note: This interview was conducted January 31, before the Solo trailer came out] but I’m not really sure what to expect. I’m interested to see when they base it and, I read somewhere it’s going to be like a heist movie, that’s really all I know about it. PB: Yeah, I imagine it certainly makes things easier to avoid spoilers if there isn’t really much info out there. PB: Now, think of yourself as the scriptwriter, based on what’s happened in Force Awakens and Last Jedi, how would you yourself write Episode IX? What do you want to see happen? What do you want answered? Blaney: I would’ve honestly liked to, I wanted to know Snoke’s story a little bit more. We didn’t really know anything about him. Didn’t really tell who he was or where he came from, didn’t really get into that. So I’d like to know a bit more about his character. And then just kind of see where Kylo’s head is going to be at here in the next one, and how that whole deal is going to operate with him running it now. We’ll see if he can handle that. I don’t know if Luke’s still going to be around. I don’t really know. PB: Yeah, that was kind of dangling out there too. Like, what’s going on there? Blaney: Yeah, like is he done? I don’t really know. But I’ll be interested to see if he’s still around. PB: I can’t let you get away without asking you something NASCAR-related and the upcoming season. You’ve had a lot of change this season, the haircut and facial hair, you shaved that. More importantly, you’re now with Roger Penske and now driving for two legendary teams in the Wood Brothers and Penske Racing, so far how has working for Roger been compared to working with the Wood Brothers. Blaney: It’s not much different. I was already a Penske driver, even when I was driving for the Wood Brothers. My contract was always with [Penske] so I don’t really think it’s a huge difference. It’s minimal change and it’s nice being in-house but I’ve been super lucky to drive for two great team owners in the Wood Brothers and RP. It’s been super-great to get to know them and know where they’ve come from. I’ve always wanted to drive a Cup car for Roger Penske. That was my dream when I was watching them cars run and then being a part of it in 2012 when I got with them, that’s what I wanted to do and it’s cool to kind of see it all come together. I don’t think it’s going to be a huge change, just a bit different in the people I’m driving for but at the end of the day, it’s all about running well and winning races and hopefully we can do that. PB: Roger has more than just NASCAR. He’s got IndyCar, the Acura in IMSA at the 24 Hours of Daytona. Have you dropped any hints about wanting to drive something like that in the future? Blaney: Yeah, I would. I’d be down to drive one of those cars in the future. Whether it’s IndyCar, the Acura or the V8 Supercars [in Australia] I would be down for anything. I just like driving any kind of race car and he’s the perfect team owner to do that. PB: How confident are you entering this season? Do you and the team have any goals you’re looking to accomplish this season? 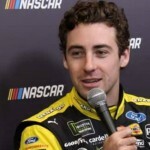 Blaney: I feel good about it. I think our teams are working pretty well right now. We have a couple new people on the team and they’re all getting along with each other. I’m excited for this year. You always just want to keep getting better, keep improving and I think we have done that over the past couple seasons. Just getting more and more out of it. I think everyone’s kind of coming together to try and make that happen and I hope we can do that and I’m hoping we’ll have a good year.